The fitness influencer and creator of the bestselling Food & Drink app, FitMenCook, shares 100 easy, quick meal prep recipes that will save you time, money, and inches on your waistline - helping you to get healthy on your own terms. We like to be inspired when it comes to food. No one enjoys restrictive meal plans, bland recipes, or eating the same thing every day. Instead of worrying about what to eat and how it's going to affect our bodies, we should embrace food freedom - freedom to create delicious meals, but in a more calorie-conscious way; freedom to indulge occasionally while being mindful of portion size; and freedom to achieve wellness goals without breaking the bank. 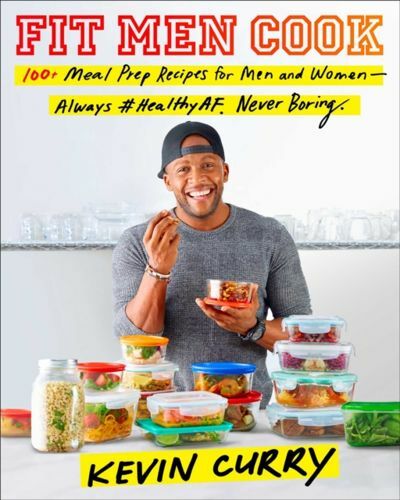 In Fit Men Cook, Kevin Curry, fitness expert and social media sensation with millions of followers and hundreds of thousands of downloads on his app, shares everything you need to live a healthy life each day- from food shopping lists to common dieting pitfalls to his ten commandments of meal prep. Readers will also be inspired by Kevin's personal story of overcoming depression and weight gain to start a successful business and fitness movement. This beautifully illustrated book also includes over 100 easy and delicious recipes including Quick Salmon Nicoise, Juicy AF Moroccan Chicken and Shrimp Chipotle Burrito Bowl, and many more to help you plan your week and eat something new and nutritious each day. With Fit Men Cook, you can create exciting, satisfying meals and get on your way to losing weight for good. After all, bodies may be sculpted at the gym, but they are built in the kitchen.